and the palm: I know -- I can hardly believe it myself! And you know what's even weirder? Knitting all those fingers (and thumb) was engaging and FUN. Why didn't anyone ever tell me how much fun gloves can be? Now, no one's more surprised about this than I am. I doubt that any of you have caught me as I'm working the finger decreases of a mitten, but if you ever have the opportunity, take note of my mood as the task of the thumb looms nearer. I am not a fan of having to pick up for and work that pesky thumb. Usually this is because by the time I hit the finger decs I'm already planning my next project, and I'm more likely than not impatient as crap to finish the mitten at hand (ha.) So why is knitting the equivalent of five thumbs, one after another, so much different? Answer: I have no idea. There was just somethng terribly compelling about watching each finger take a bite out of the held stitches; watching each finger cling onto its neighbour and then grow more stitches of its own for the next finger to cling onto. 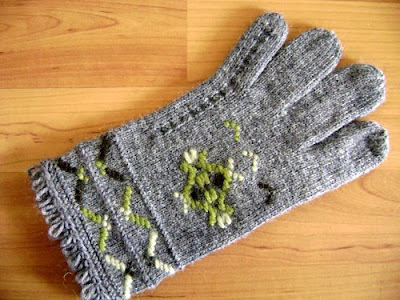 It was a lot of little achievements stacking up and turning into one big achievement -- the finished glove, with all the fingers finished and in place, all those stitches used up and accounted for -- and, oh, yeah, the total lack of grafting didn't hurt either. I'm even casting on for that second glove tonight. But you know what? I still grumbled about knitting that thumb. Go figure. April 22, 2009 at 8:24 a.m.
April 23, 2009 at 12:40 p.m.
April 25, 2009 at 5:05 p.m. Beautiful!!! You make me want to try them, too. April 30, 2009 at 8:50 a.m. I can has Stu Gee-Oh? I've moved! 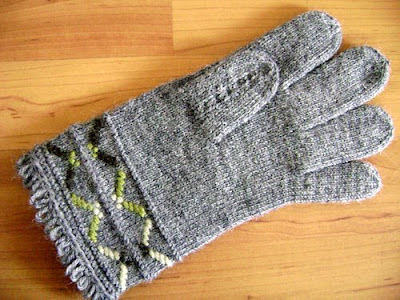 Free mitten pattern up for grabs!